If I turn on the red light, the "R" gets grounded and therefore applies 12v to the rail. The 3 MOSFETs on the images are P0903BDG MOSFETs. Alternatively, I can hook into the IR signal and send an IR signal using the ESP8266. That would be really awesome, as it only requires 3 wires. How that is possible, I'm not really sure, though. I know it's possible to make your own circuit using IRLZ44N MOSFETs, which I have done before, but I want to try and use as much as this circuit as possible. I tried to do the same thing with hooking up an IR LED on a Raspberry Pi. It worked pretty well but the chip on the receiver board could not take fast switchings. I ended up doing my own PCB. The problem is that the chips run at voltages higher than you would use for an ESP8266 or Arduino. This will be the biggest problem if you want to supply it with the voltages available on the board. 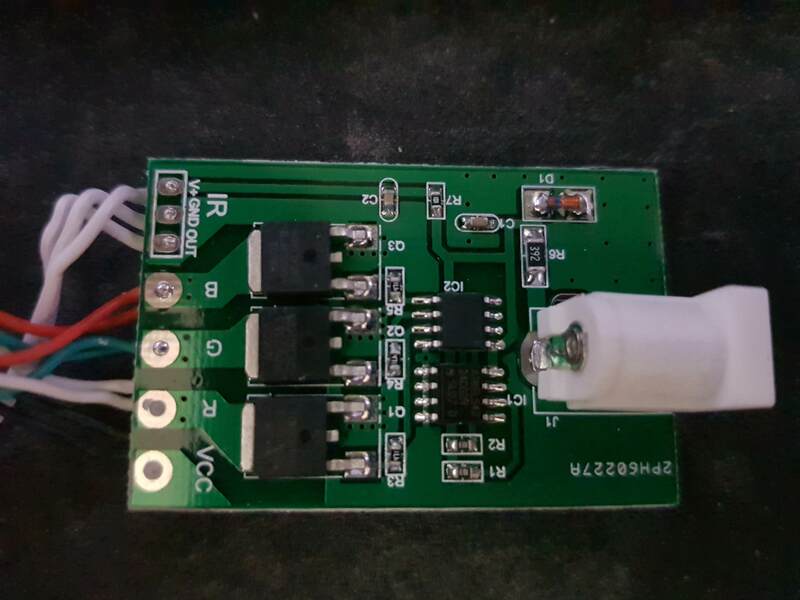 I think the safest thing is to see if you can simulate IR input by just connecting to GND and OUT of the IR receiver port. Not the answer you're looking for? Browse other questions tagged esp8266 led rgb-led led-strip or ask your own question. Multiple RGB led strips with Uno - options? What's the required voltage for ws2815?